I'm surprised Florida has ever produced any fiction writers with such overwhelmingly bizarre factual material! Excellent article. We in Louisiana have our share of idiocy. Louisiana - a state of confusion. New Orleans - where the weak are killed and eaten. And we have gators and cottonmouths as well and a wonderful infiltration of tarantulas brought from South America through the port of New Orleans with the banana trade. Janice, when I look back on the items I rejected, you definitely have a point. It's hard to blame our leadership– or lack of leadership– when so much of the state seems hell-bent on madness. If we had cliffs, we're run like lemmings. O'Neil, at least you have culture– wonderful music, superb foods, clever authors, and a multi-cultural approach to life. We have no such excuse. Besides, we're the only state with our own fark.com tag… we're that bad. Leigh, in recent years, South Carolina has produced some real "doozies" when it comes to almost unbelievable events. However, you're the winner. Florida still outdoes us in accomplishments of the dummied-down. Thanks for what would bring smiles except for the fact humans are sometimes so idiotic that they make me want to cry. No wonder we Canadians like to vacation in the Independent Country of Florida! Constant entertainment and personality galore. Never boring, that's for sure! Really entertaining post, Leigh. Fran, I don't know what it is– perhaps the heat– but it's impossible to compete with our insanity. Even our geology is different. Experts believe Florida broke off from a different part of Pangea in ancient days. Melodie, you're very kind. We'd undoubtely be far worse without Canadian moderating efforts. By the way, this strange safari came to my attention a few minutes ago. Heh ... I was born in Florida but we left there when I was 8 months old & I've never been back. I live in upstate New York now. The most likely candidate I can think of at the moment for the Darwin award is a woman who got busted at a grocery store for putting FULL soda bottles & cans, which she stole off the store shelves, into the machine that dispenses bottle scrip. In N.Y. state you get 5 cents of scrip for each bottle or can, which she then would have needed to cash in at the register at the same place she took the sodas. It's non-transferable. Coincidentally, I recently enjoyed Carl Hiaasen’s latest (Razor Girl) and thought his characters’ latest Florida hijinks were outré nutty – until I remembered your Florida madness posts here. Elizabeth, what a story! And what a dolt she was, going directly from scrap to scrip. 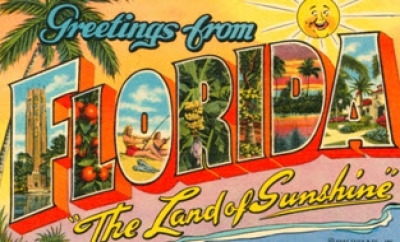 I’m not sure, but your psyche probably healed once you left the Sunshine state. Peter, the amazing part is that Carl not only doesn’t need to exaggerate, he may have to play down some of the more outrageous happenings in our state. Everyone treats the lunacy as normal. Think of Florida as a demented family with 20-million mad aunts and uncles, nephews and nieces. Leigh, I love Florida, but I also love these great looks you give us into its crazy citizens. Though I've never lived there, I've been there dozens of times for both business and pleasure (and I have plenty of relatives there as well), and I agree that both you and Hiaasen have a pretty accurate take on things. I also agree with O'Neil about the level of dysfunction in his home state--and we can just about match that in Mississippi. Maybe it IS the heat . . .
And humidity, John– there may be some kind of crazy-making pollen in the air! Leigh, I'm very late in commenting (power outage followed by computer complications), but I'm glad I didn't miss these stories. I've spent just a couple of days in Florida--I'll have to go back and look around more!